Is Hong Kong really a bilingual society? Form 6 and 7 students should listen to this recent broadcast on English in Hong Kong. Go to http://skhsslmc2talk.edublogs.org/ to find a link to the broadcast. Listen and leave some comments. For the Speaking exam I need to …. 1. In the Speaking exam, it is important to pay attention to what the others are saying. Do not sit there thinking about what you are going to say next. 2. VOCABULARY is very important. If you don’t know the words, it can be hard to say anything. If you are taking too long to think of a word, it will effect your fluency. 3. Spelling doesn’t matter in the Speaking exam. Your notes should be short and readable. 4. Get over your bad HABITS. Habits are things we do regularly and often without thinking. Make sure the habits you have for your speaking exam are good ones. I’ve just come back from 4 amazing days in Canberra – the Capital of Australia. I spent hours at museums – and even a LEGO exhibition. Did you use LEGO when you were a child? Do you still play with LEGO. The models were amazing. In the meantime, there are more reference articles for you to read and comment on in the “What do you think blog” – one on punishment – (maybe you’d like to suggest what the punishment should be if anyone doesn’t do all of the homework I set for the holidays!!!! What “reward” should I bring back for the person who has done the most / best recording? I’ll also add an article on sleeping from the ABC. I’m sure that’s something many of you have been doing a lot of during the holidays. At this site, you can find many talks on some curent topics and great ideas. AND …. the talks have subtitles in English. Many are also subtitled in Chinese. 1. Watch the video WITHOUT subtitles. Try really hard to listen to the words and understand. 2. Watch the video again – WITH subtitles. Be aware of the words you missed before. 3. Watch the video again – this time with Chinese subtitles. Take note of any important words you didn’t know when you watched the first two times. Choose two words to learn really well – definitions, related words, pronunciation! We will discuss some of these next year in class. Think about them now and the class discussion will be so much easier! And while we are on the subject of English, if you missed the Pearl Report on June 27 about English in Hong Kong, you can catch it here : http://programme.tvb.com/news/pearlreport/episode/ along with other past episodes that will develop your knowledge about many things in Hong Kong! Over the year you will have spent 368 hours improving your English. Imagine the difference that will make! It’s sometimes hard to work out what the time is because clocks are all a bit different. This site : http://www.biglearning.com/game-weird-clock-faces-challenge.htm has a great game to challenge your skills in telling the time from lots of different clocks. In class at the moment we are looking at “the Watertower” by Gary Crew. This is a Picture book with lots of mystery. Students are using thinking hats to look more closely at some of the themes in the text. 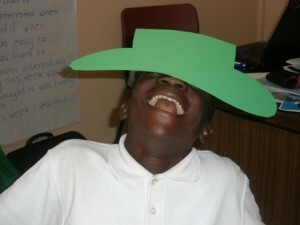 Eli is using his “creative hat” for a bit of fun during class though we all agreed that the story is a bit scary.